Apple flavours seems synonymous with autumn more than summer, but somebody in product development seems to disagree with me. 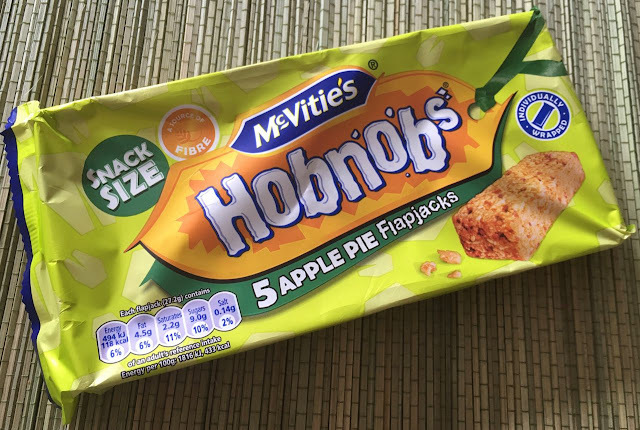 Yesterday I wrote about the new Taste of Caramelised Apple sweets from Werther's Original and today’s new product is McVitites Hobnobs Apple Pie Flapjacks. On the bright side I love these flavours, and welcome them at any time of the year. I get a bit tired of the idea that cinnamon has a season too, I have it all year round. There are five Apple Pie Flapjacks in the multipack and they are all individually wrapped, making them perfect as a lunch box treat. They do seem fairly small but I think this counts towards good portion control as flapjacks tend to be rather rich. The flavour is impressive, the apple taste is pleasingly strong and fruity, and the rich syrupy golden taste shines through, with a lovely background spiced buttery flavour. The texture is good, the bars are jam packed with oats, and they are firm but not hard. They give easily when you bite in. I thought that these McVitites Hobnobs Apple Pie Flapjacks were superb. 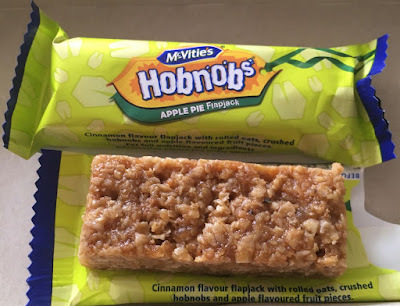 I don’t eat a lot of flapjacks but the addition of the apple and cinnamon made these perfect for me. It added a nice fruity edge and it made them a lovely treat. Certainly one I’ll be packing in my lunch box.